Thanks to bloggers everywhere for making Podcasting News the #1 site for iCrap. We’ll figure out how to monetize that real soon….. 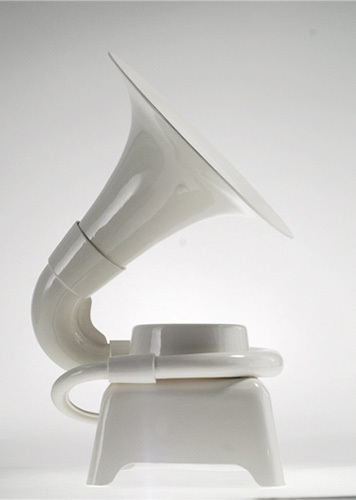 In the meantime, here’s something that’s even more useless than an dog jacket that transforms your pooch into a doggie boombox – an iPod gramophone. Through passive amplification alone, the Phonofone II “transform any personal music player + earbuds into a sculptural audio console.” The Phonofone exploits the virtues of horn acoustics to boost the audio output of standard earphones to up to 55 decibles, about the maximum volume of laptop speakers. The Phonofone II will set you back about $900.